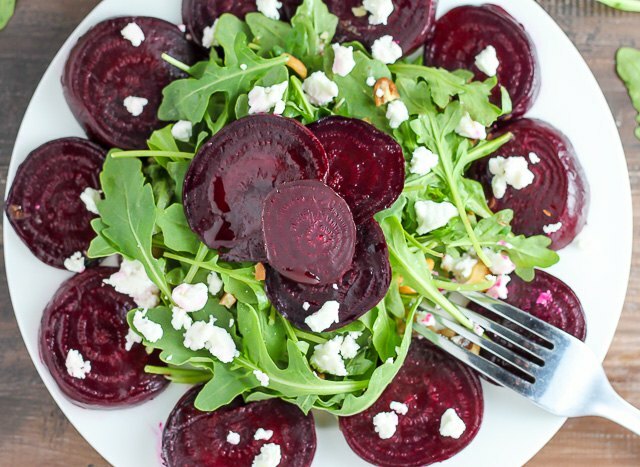 Loaded with vitamins and minerals, roasted beets make a delicious -- and colorful -- salad. You can experiment with endless ways to doll up a beet salad, but this recipe presents a classic combination: peppery arugula, crumbled goat cheese, chopped walnuts and, of course, roasted beets. The salad is lightly dressed in a homemade red wine vinaigrette, which helps highlight the beautiful ingredients and ties the dish together. 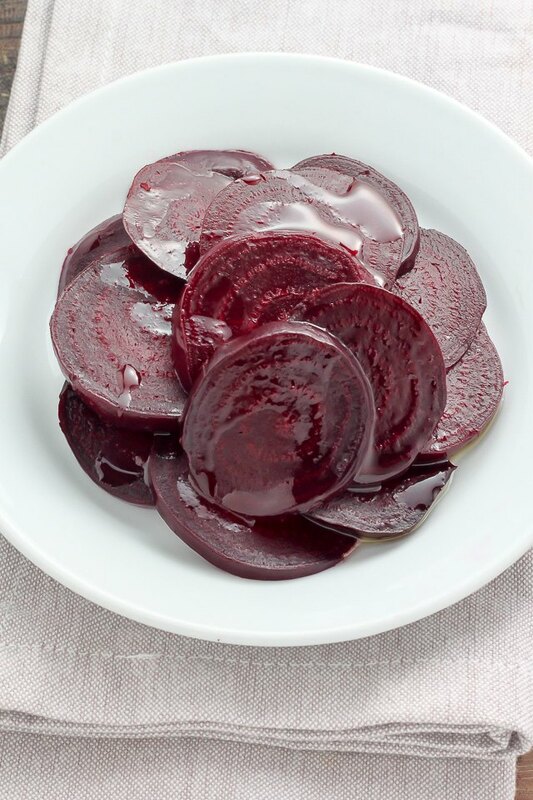 Learn how to roast beets following the simple tutorial below, make a quick dressing and then build a healthy salad. Heat the oven to 400 F. Slice off any stray beet leaves, and scrub the beets thoroughly. 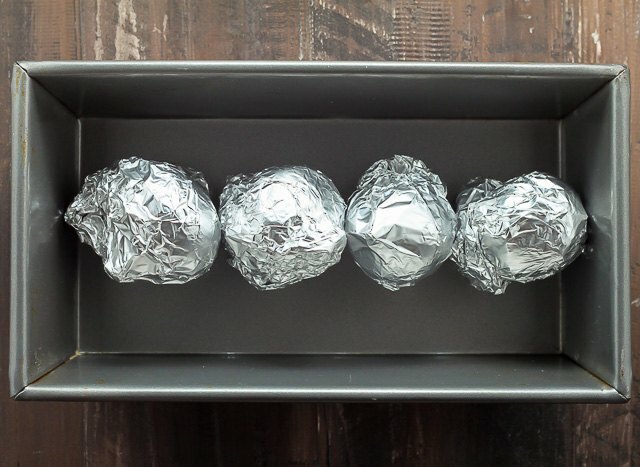 Drizzle the beets with 3 tablespoons of olive oil, and loosely wrap them individually in foil. 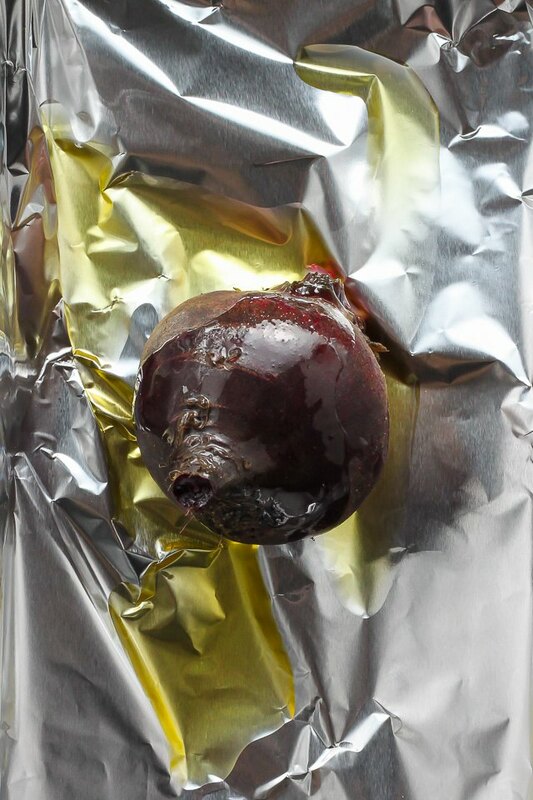 Transfer the wrapped beets to a baking sheet, and roast them in the oven for about 60 minutes, or until a fork or skewer slides easily into the middle of the beet. Let the beets sit on the baking sheet until they're cool enough to handle. 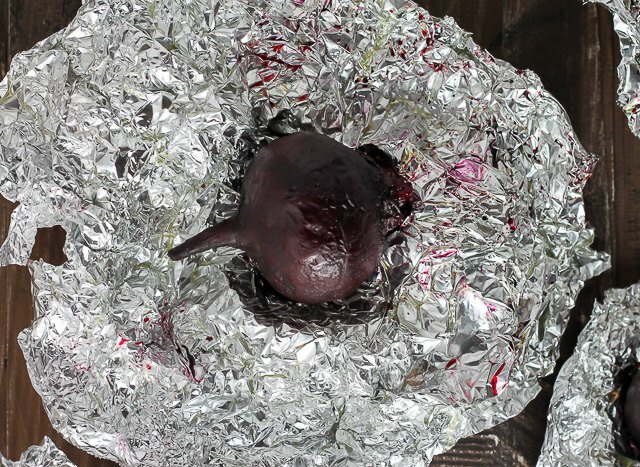 Unwrap each beet, and hold it firmly in a paper towel while using the edges of the paper towel to rub away the skin. The skin should peel away very easily; if it doesn't, the beets likely need to cook a little longer. Peel all beets. 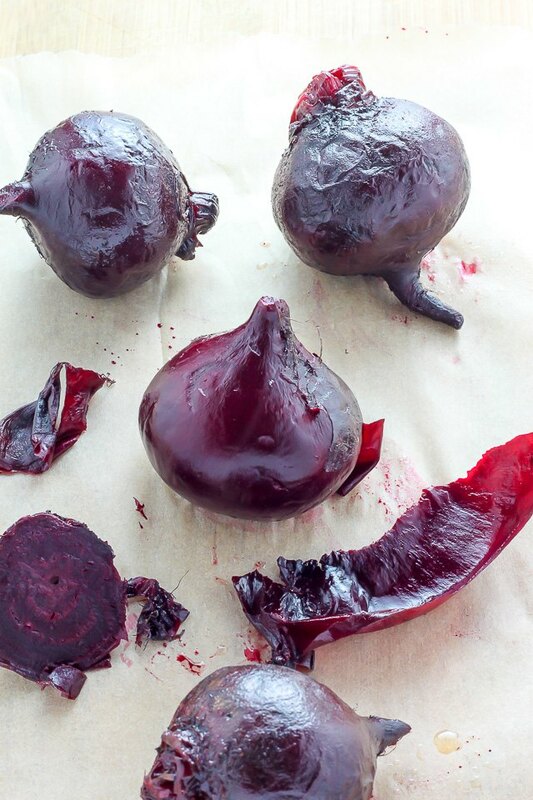 Slice the beets thinly, and store then in the refrigerator until needed. To make the vinaigrette, place the vinegar, lemon juice, honey, salt and pepper in a blender. With the motor running on medium speed, add in the remaining 1/2 cup of oil, pulsing until the mixture is emulsified. Store in the refrigerator until needed. 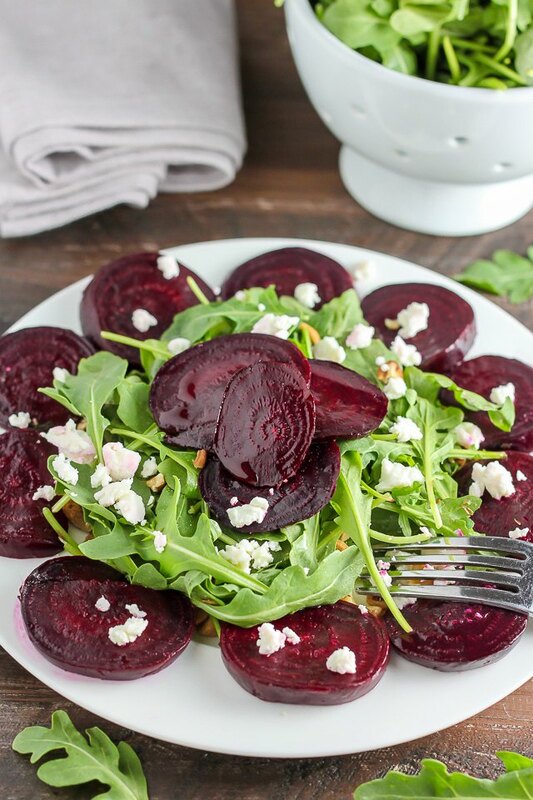 When ready to assemble the salad, place the arugula on a large serving platter and beets around the sides. 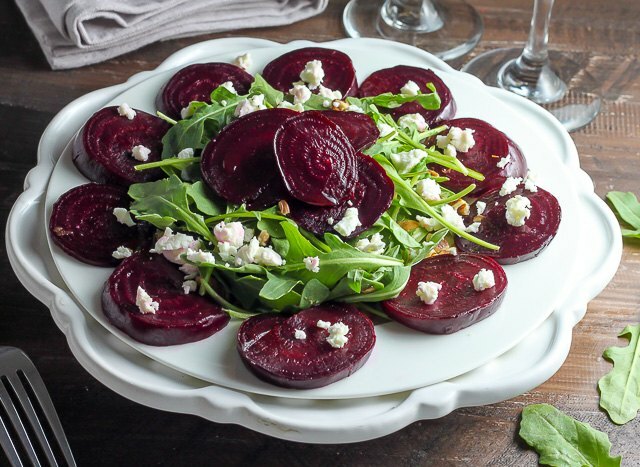 Sprinkle walnuts and goat cheese over the top, and arrange a few sliced beets in the center. Drizzle with vinaigrette, and serve at once.